Pretty certain the 'leaked' plot is faked, but I am genuinely puzzled by no mention of Rose. No Kylo or Hux sightings either. Even though we know they have already been filming. Perhaps things spoilery enough that they had to film them inside the studio. Wasn't Billy Dee supposed to be filming in September too? @californiagirl wrote: No Kylo or Hux sightings either. Even though we know they have already been filming. Perhaps things spoilery enough that they had to film them inside the studio. Wasn't Billy Dee supposed to be filming in September too? Billy Dee Williams canceled a September con appearance a month or two prior, so it's been assumed that it was for filming IX. Not all actors are going to announce their location on social media or whether they are filming SW or not. Boyega, Grunner, Monaghan like to tweet/IG about filming. oscar's wife tweets about places she visits but that's not the same as going "Look, I'm filming SW in Jordan". we happen to know that there's filming so we put 2 and 2 together why she is there (hubby works) but her intention wasn't to broadcast that Oscar is filming. That's quite a thorough list. 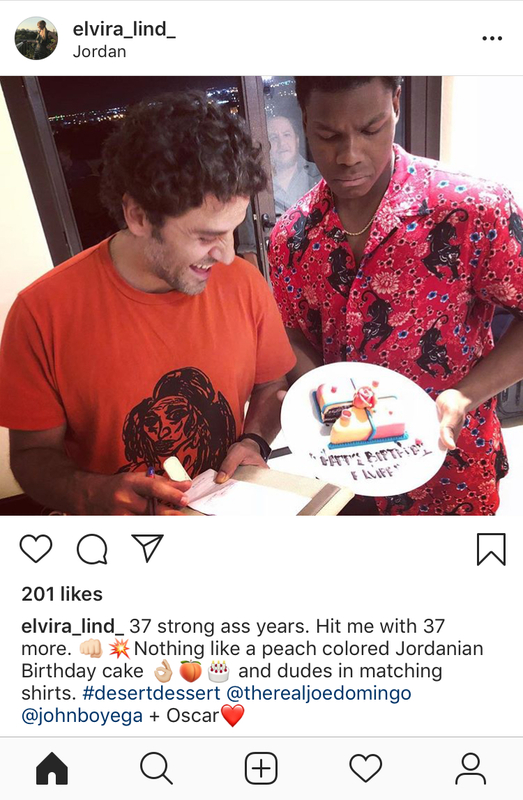 If they truly are in Jordan for 3 months, that's a third to half of the movie. There were supposed to be huge sequences in act 2, correct? Now I'm wondering if this is really a planet we know at all. Yup, according to what JJ told Dominic, there would be "massive sequences" in Acts 2 and 3. Based on the extent of filming there, I think it's safe to guess that the Jordan planet is where the massive Act 2 sequence takes place. Yeah, I'm thinking it's a new one... and of course they could make the planet look less 'desert-y' depending on what they do w/ coloring/backgrounds. Otherwise, indeed..perhaps a new planet ?? The contract was for 14 shoot days, but these were not on specific dates as the shoot was weather dependent. In the application, the equipment listed includes fog and mist machines. Some stunts also took place but no specific details as it has been blocked out under the stunts heading. They are totally filming together! 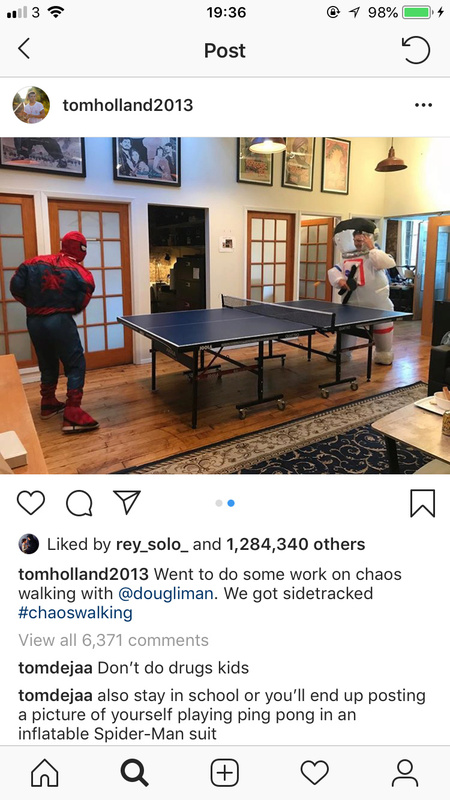 Soo Tom Holland is working on ChaosWalking right now, surely Daisy would be with him? I recently read that the makers of Wreck it Ralph 2 wanted to include a 'Kylo Ren parody' where the character was depicted as a spoiled brat, and either Lucas film or Disney asked them not to show him as such. No threats, just a 'polite request'. I get the impression they want him to be sympathetic....it seems they're concerned rather than annoyed. It is interesting to me that they apparently used the wording that he was their "villain." I just don't see him as such anymore. But I'm sure that's a function of how invested I am in saving Ben Solo's soul. And mind. And body. @PalmettoBlue wrote: It is interesting to me that they apparently used the wording that he was their "villain." I just don't see him as such anymore. But I'm sure that's a function of how invested I am in saving Ben Solo's soul. And mind. And body. What else are they going to say at this point? "We want to make his redemption in IX more believable?" And technically, he is set up to be the main "villain" in IX, even if most of us don't believe that he'll stay that way past Act 1. I agree. They wouldn't reveal something like that to someone who's not involved in the production of the movie. I have just defended him on social media......sorry, but I'm a bit tired of the OC seen as saints, while poor old Kylo gets mocked for being neglected, psychologically abused, and very nearly getting decapitated while taking a snooze. In SW: Women of the Galaxy, Leia's entry is interesting with the wording. Now, ISeeAnIsland is correct, they need to be careful. On the other hand, I have noticed that Leia (and Rey's) entries are composed in a way that is...timeless...but present. After all, LF wants the book to be a collectible but not feel dated next December due to reylo and bendemption. "Through all of her tribulations and victories on the battlefield, Leia has more ordinary issues, too - the kind of issues faced in this galaxy as well. She falls in love with and marries Han Solo, a politics-averse scoundrel, and she gives birth to Ben Solo. Navigating parenthood isn't simple for Han and Leia, especially since Ben is a Force-user, like his mother and uncle Luke, and the depths of his power and emotions are unclear. His turn to the dark side and the First Order cuts to Leia's core, and makes her feel like a failure. But she doesn't give up on her struggle against the First Order - even following the horror of Ben (now Kylo Ren) killing his father Han, in a moment made possible only by his parents' belief in their son's possible redemption." What does Rey's entry say? Thank you so much for posting, i screen shot this and posted on twitter! The wording does sound timeless, i love the focus on Leia’s relationship with Ben and the belief in his redemption eek! And she is acknowledged as a Force-user! Posted by Gaslight was wonderful in posting photos in his tumblr of her entry. My apologies for teasing it, and not posting it - primarily because I was hoping those better in meta would attempt it first...Rey's entry is the big one, if you will due to the importance of the ST, reylo and bendemption. Here goes with my cliff notes version! What is phenomenal about hers, and again - you know Amy had to submit each word for proofreading, is that what antis focus on (to appear feminist woke), becomes trivialized in a few words, plus powerful. "Her abilities awaken powerfully after she's captured by Kylo Ren, and his reaction to her strength emboldens her to test her newfound skills. The resolve we see on Jakku returns as she escapes and confronts Kylo Ren head-on." "Rey turns to Kylo after her bewildering experience in the mirror cave on Ahch-To. Again, Rey maintains an open-mind and is willing to put faith in Ben Solo - a man she saw murder his own father. She doesn't forget the horrific act, but she gradually senses his conflict and sees an opening to turn Ben back to the light, and she doesn't let go until he draws a line."